Hi friends ! this Dosa recipe is an Andhra Pradesh specialty and is known as Attukula Attu or Poha Dosa. It is an amazingly soft, spongy, porous dosa. Is fluffy inside and crisp on the edges and makes a delicious week end breakfast. It can be served with tomato chutney and sambar like any other South Indian dosa. wash the rice and poha / Flattened rice /beaten rice in a bowl. Soak the rice, Fenugreek seeds and poha in the buttermilk mixture over night. Grind to a smooth batter along with the soaked in buttermilk. Add soda ,salt and mix well. Keep aside for 1/2 an hour. 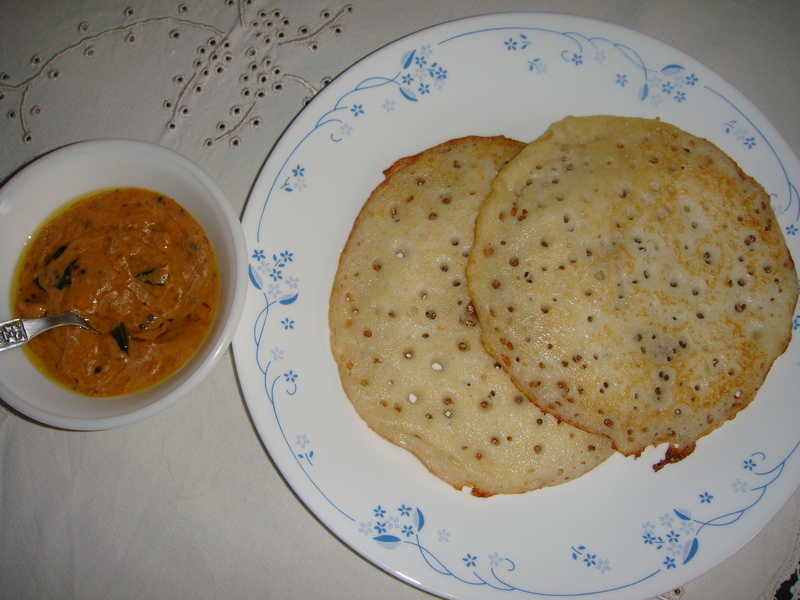 Heat a non stick tava or griddle take a ladle of batter and spread the batter and make a ¼ inch thick dosa. Drizzle oil on the dosa and around the edges. Cover the dosa with a lid and cook on medium flame for 1-2 minutes till the base is cooked and crisp and the top is soft and spongy. Flip and cook the other side. Serve poha dosa hot with Tomato /coconut chutney and pumpkin sambar. Andhra Pradesh cuisine is a cuisine of South India native to the Telugu people from the states of Andhra Pradesh and Telangana. It is also the cuisine of the Telugu-speaking population of Karnataka and Tamil Nadu with slight variations due to local influences. Generally known for its tangy, hot and spicy taste, the cooking is very diverse due to the vast spread of the people and varied topological regions. All three regions — Coastal Andhra, Rayalaseema and Telangana — have distinctive cuisines, where in semi-arid Telangana state region millet-based breads (roti) is predominant staple food, while rice is predominant in irrigated Andhra and Rayalaseema regions and ragi is popular in Rayalaseema regions which is predominantly semi-arid. Many of the curries (known as koora), snacks and sweets vary in the method of preparation and differ in name, too. The state is the leading producer of red chili, rice and millets in India influences the liberal use of spices — making the food one of the richest and spiciest in the world. Vegetarian as well as meat and seafood (coastal areas) feature prominently on the menus. Dal (lentils), tomato and tamarind are largely used for cooking curries. Spicy and hot varieties of pickles form an important part of Telugu cuisine.